Guests enjoy fire-side activities such as roasting marshmallows or making Smores. Fire pits are assigned to groups each night in one of two time slots. Often fire pits are not assigned by where the group stays. We like to schedule each group at least one night during their stay for using the stage, with a preference for larger groups to use the stage. Please check your scheduled rotation for which fire pit to use each night. 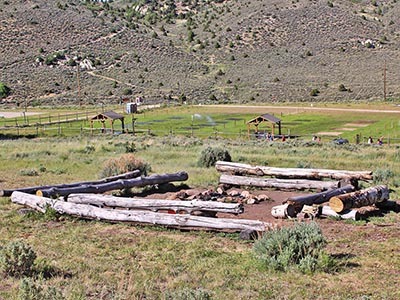 The Tabby Mountain Fire Pit is located east of the Tabby Mountain Lodge and seats up to 60 persons.